The post-war buildings built in the city centre are not known for elements that define a “good plinth”. The public space is car-orientated and many city blocks are mono-functional. Even worse, most buildings have a long footprint, which forms long stretches of streets or blocks, and most façades are stretched in horizontal ways. Also the façades of post war buildings are not as expressive as 19th century buildings (or older) and they have fewer details. To make high-quality plinths, we created a set of specific criteria that adjusted to post-war buildings. We took the knowledge of many Dutch and international experts and extracted the basic criteria and guidelines of a good plinth in a modern city centre. We combined these criteria with research by the municipality on how people use the city (via extensive pedestrian surveys). The result was a comprehensive study and a strategy. From the initial study, we defined a plinth as a combination of public space, the ground level plus the first floors of the adjacent buildings and the programme (use or activities) it contains. 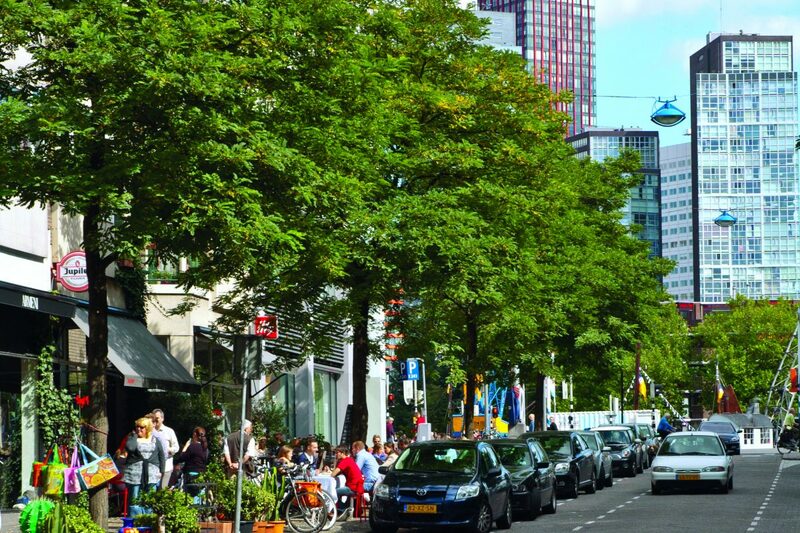 In 2008, the municipality of Rotterdam introduced a new plan for the inner-city: “Towards a City Lounge”. This plan emphasized the role of the street level and the way we experience the city centre. 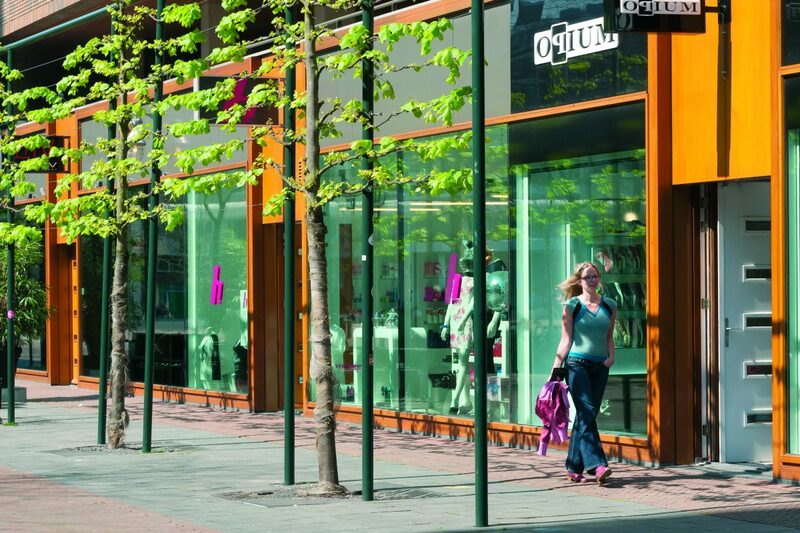 As a result, we initiated many street and public space improvement projects and launched the citywide plinth strategy “Rotterdam at eye level” in 2011. Although the framework of the plinth strategy provided all the information and all the tools we needed to create good plinths, we quickly noticed that ownership is the key for successful plinth transformation. The owners (and actions) regarding sustainable improvement of streets and plinths can be divided into three distinct groups: public space, programme, and building. In our experience this division allows for the right mix of interventions and actors for successful plinth revitalisation. Each group has it’s own different set of tools, time frames, and owners. Good plinths and good public space are two sides of one coin. Together, they make the city at eye level experience. Traditionally, the design and maintenance of the public space is a government privilege. 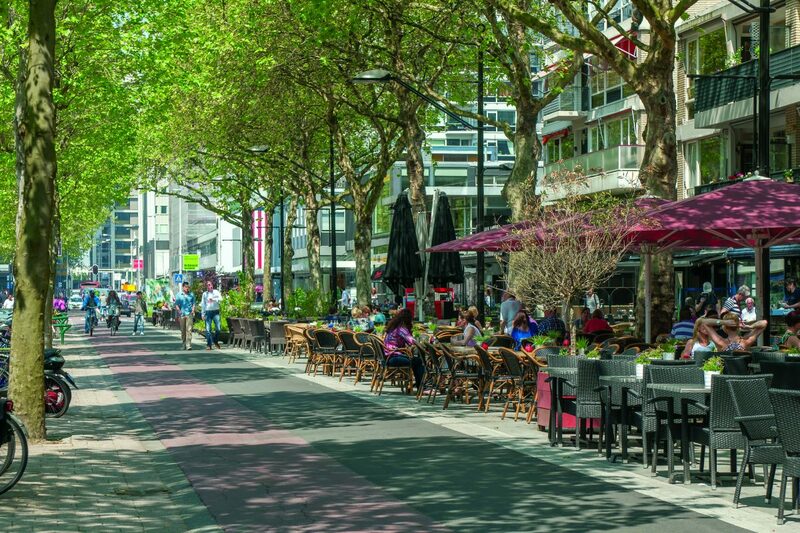 Since 2007, Rotterdam’s public space design strategy is shifting towards a focus on pedestrians and cyclists. The eight years since, were wonderful for public space improvements; funding from the municipality was abundant. Recently, however, funds dramatically reduced. 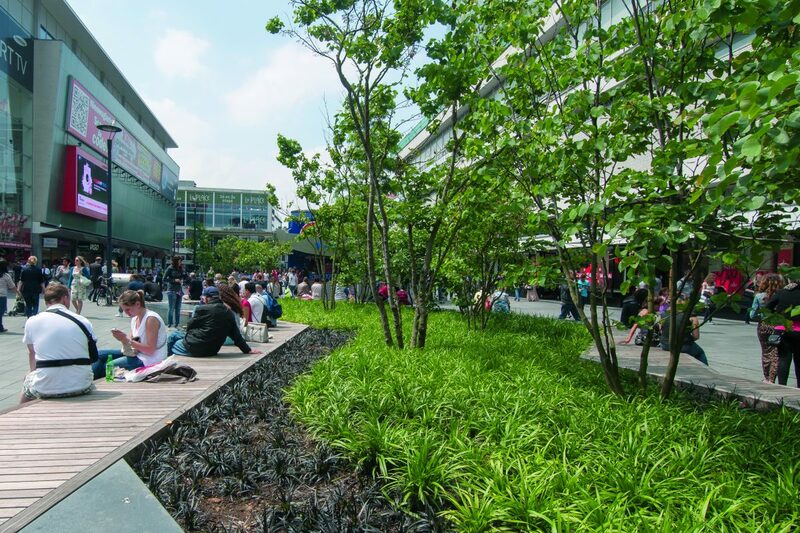 Experimental or temporary methods for transforming streets are now at the top of the agenda. Examples include “parklet” installation in parking spaces to increase the use of the sidewalk, mobile greenery, and fewer restrictions for the use of a street. A new trend is allowing private parties to design and (especially) maintain public space, only when the party owns a large amount of real estate adjacent to the space. This tactic seems to be a win-win: the city saves money and the public space is enhanced. Plus, the private parties are in for the long haul; there is no “hit-and-run” development; they understand that the value of their property will increase if the public realm is well designed and maintained. The success of a street, and how the plinths function, depends on the right programme. Listening and anticipating the demands of its users are key. Two trends are shaping the way our streets are used: the internet and the sharing economy. Because of the ever-growing influence of the internet on our daily life, shopping is becoming more of a leisure activity than a daily need, resulting in decreased commercial revenues and increased vacancy. The sharing economy is also a culprit. The younger generations tend to prefer use above ownership: owning a device/good is less favourable, while lending or leasing is becoming more popular. The sharing economy is driving new ideas for uses and activities on our streets, such as co-working spaces. Entrepreneurs dictate the type and variety of programme, but also tend to focus on their own business. Running a small business costs time and revenues are often slim, and due to lack of time and funds they are unwilling or unable to make changes to contribute to a better street/plinth. After several meetings with entrepreneur associations we learned a valuable lesson: success lies in small, easy to implement, and low-cost actions. Also simplify the (sometimes technical or spatial) information and break it down in comprehensive parts. For example, with the city maintenance department and a lighting specialist, entrepreneurs could install lighting themselves with the right parameters for intensity, colour and the positioning of spotlights. Within a couple months over a third of the entrepreneurs in the street made adjustments themselves. A more traditional example: rolling shutters are often used by businesses during closed hours. The shutters are metal, invite graffiti, and are plain ugly. Through legislation, the local government incentivized shop owners and entrepreneurs to exchange these shutters for more pleasing alternatives. For a given time, the new shutters were partly paid for by the municipality; afterwards, the legislation forced the remaining shop owners to change their rolling shutters, but without the subsidy. For large-scale street and plinth improvements, real estate investors (and other building owners) are the major players. Of course, investors are looking out for their own real estate. The more owners on one block, the more competition exists for the same programme. More competition means more eyes on the price: profit. This turns out to be a deadly strategy for streets and it leads to repetitive, generic programme and higher vacancy. Thus: the fewer the owners, the better. With fewer owners it’s easier to understand that having a good and pleasant street is crucial for long-term business. A diverse and unique programme will not generate the desired m2 price for a particular building in the street, but the street as a whole will benefit of this program and will boost income for the shop owners and building owner, and they will enjoy much lower turnover and vacancy rates in the long haul. In the streets in Rotterdam with a shared vision, the success is evident. There is no blueprint for a successful plinth strategy. It all comes down to the question: who is really caring about a street or place? Entrepreneurs? With entrepreneurs, be prepared for a process with an uncertain outcome. New initiatives will be focused on either cosmetic changes or new programme (inside and outside). The role of the municipality is restricted to (mostly small interventions in) the public space and aiding in legislation for temporary programme, activities, or new formulas. Changes are possible but take much longer and the municipality needs to organise and help establish a common ground. For the most success: simplify the information, break it down in to easy steps. Provide actions that are low-cost and easy to implement. Communal branding of the area or street is important and usually done by a retailers association. Building owners? If building owners care, funding for investments, renovations, and space restructuring (inside and outside) is easier to accomplish. Street management can make real change with a dedicated “street manager”, who makes the street more attractive, physically and economically. This way all the stakeholders have a voice in the public space, programme, and building contexts. New entrepreneurs will follow. Street management gives stakeholders confidence that all parties are taking action as agreed. Furthermore, branding by a street manager is more objective and consequently lasts longer. General interest is placed above individual interest and short- and long-term possibilities are thoroughly examined. Local government? When the municipality is the only responsible party to improve the quality of a street, we strongly believe no effort should be undertaken (yet). The cooperation and willingness of entrepreneurs and/or building owners to embrace an improvement process is absolutely vital. If none of these parties are in the coalition chances are that substantial public funding is needed and the execution of the plan is limited to a short period of time. After completion of the project the decay might easily return. At this point, only legislation can prevent further decay of the street or space. Regulation remains one of the most important tasks of the municipality. Next to zoning plans, aesthetic policies form the base of the plinth strategy. When people started investing in their buildings we noticed an increase in requests for public space beautification. Two other emerging elements are research and what we call brokership. Our earlier research about pedestrian flows gave vital insight into the dynamics of plinths and streets and reshaped policies and actions. Brokership is the quick exchange of information about vacant shops or trending activities. The municipality still remains a connecting element between owners, residents and entrepreneurs. These three types of ownership all provide a different pace of development. Programme can change within a year; public space changes every 20 to 40 years; and buildings have an even slower rate of change. By connecting specific ownership to a need for change will define short-term success, structural adjustments, and long-term ambitions. The main lesson from executing the plinth strategy these last couple of years comes down to the necessity of a good analysis of ownership at the beginning of a transformation process before taking initiative. It all comes down to who cares the most.